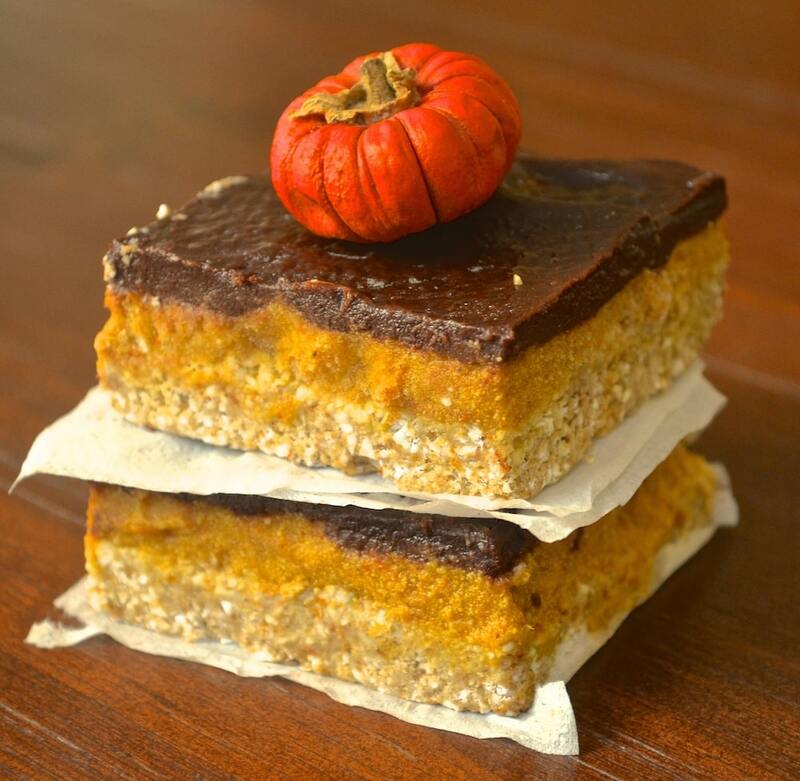 Pumpkin and chocolate are always a winning combination and these no bake Pumpkin & Chocolate Squares are no exception! With creamy pumpkin and rich chocolate on a crunchy, crumbly base they are sure to satisfy those sweet cravings this Fall. I know, I know, this is another pumpkin recipe but I just couldn’t resist. I think this will be my last one for the year but I am not going to give you my world just in case I get some last minute pumpkinspiration. This whole recipe happened because I bought a big bag of buckwheat groats to make an oatmeal alternative with. While making my breakfast, I tasted some of the raw groats straight from the bag. I had never tasted them raw like that before and I thought they would be very hard and difficult to chew but they weren’t. I loved the nutty, crunchy texture and immediately started thinking of ways to use them in recipes. Buckwheat groats are so good for you and are naturally gluten free so are safe for celiacs to eat. They are the hulled seeds of the buckwheat plant which is a relative of rhubarb and provide complete protein, including all of the essential amino acids. They also have a very high concentration of rutin which helps strengthen capillary walls. This is great for protection against cardiovascular disease, varicose veins, hemorrhoids and other health problems caused by poor circulation. Rutin is also known to have anti-inflammatory and anti-arthritis properties, help women who suffer from PCOS and insulin resistance and improve gut health. 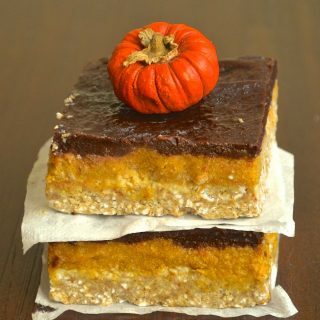 I have used the buckwheat groats in the base of these Pumpkin & Chocolate Squares. They give a delicious, crunchy, almost cookie like texture. If you struggle to find them locally, I have given some substitutions in my recipe notes. If you can get them though I really do recommend you use them. If you are anything like me, then you probably struggle to eat sweet treats like these in moderation. Well, guess what? It is totally easy not to over indulge with these as they are stored in the freezer! Keep them in an airtight container and just remove them as needed. After about 30 minutes they are ready to eat. Don’t try to keep them at room temperature as the pumpkin cream will become too soft and the base will go soggy which defeats the object of using those lovely crispy buckwheat groats. I do hope you aren’t too pumpkinned out to try these. If you do make them please leave your comments below. I would love to know what you think! Share your pictures with me on Instagram or Twitter. I am @avirtualvegan on both Twitter and Instagram. Add the hashtag #avirtualvegan on Instagram so I don’t miss them. 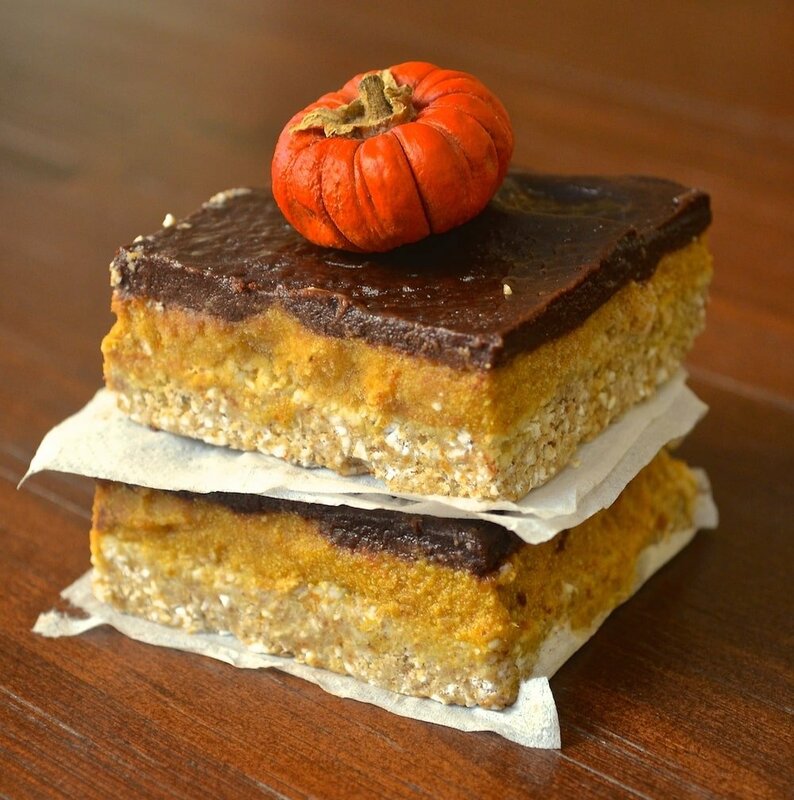 If you love pumpkin then check out my Pumpkin, Pecan & Chocolate Granola Bars. They have been getting amazing reviews on Instagram and Twitter this week. 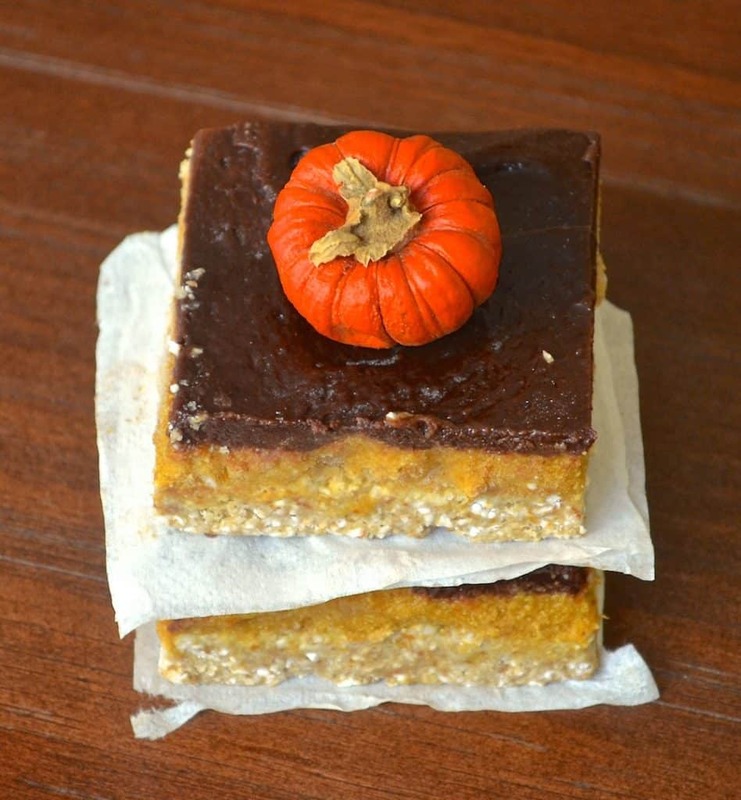 Pumpkin and chocolate are always a winning combination and these Pumpkin & Chocolate Squares are no exception! With creamy pumpkin and rich chocolate on a crunchy, crumbly base they are sure to satisfy those sweet cravings this Fall. Line an 8 x 8 inch tin with parchment paper. Add all of the base ingredients to a food processor and process for 2 - 3 minutes until like crumbs. Don't worry if some of the buckwheat groats still look whole. Press the buckwheat & oat mixture into the tin evenly. Place in the freezer while you make the filling. Scoop out the cream (just the cream, no liquid) from your can of coconut milk and whip in a stand mixer or with a hand held mixer until soft and fluffy. If you don't have a mixer you can use a food processor. You won't get quite as good a result but the recipe will still work. (You can use the leftover coconut water from the can in a smoothie or a curry. Add the remaining ingredients and whip until well combined.You might see white flecks from the coconut milk but that's normal. Pour the pumpkin cream over the base and return to the freezer. Once firm to touch start melting your chocolate. Add the chocolate chips and the milk to a bowl and place over a pan of simmering water until melted. You may also use a microwave but do this on a very low heat and in 20 second increments as it is easy to burn chocolate this way. Return to the freezer until solid. It is usually best to wait until the next day to be sure. Once solid lift out of the tin and slice into squares. You might need to let them defrost a little first before you can get a knife through them. This doesn't take long though. Once cut up these squares need to be stored in the freezer. Remove 20 - 30 minutes before you want to eat them and let sit at room temperature. Buckwheat groats are quite commonly available in health food stores & some standard grocery stores. They lend such a great biscuity texture to these squares that I really recommend you try to get hold of some. If however you can't, you can sub them for nuts. Pecan nuts would probably be best but walnuts would also be good. Medjool dates have a wonderfully soft and caramelly texture. You can usually find them in the produce department of most grocery stores. If you can't find them then sub them for regular dried dates but soak them in warm water for 10 minutes before using. As regular dates tend to be smaller I would double the amount and use 20. When at the grocery store choosing the coconut milk for the pumpkin cream, shake the cans. You don't want a really sloshy one. You should choose one that feels like there is something solid with a little bit of liquid in there. Once you get shaking you will see what I mean. If the Thai Kitchen brand is available then that is usually a brand that is always good for this. You will need to experiment with other brands by doing the shake test! If you cannot get Pumpkin Pie Spice where you are, it is very simple to make yourself and great for adding to all sorts of baked goods like apple pies or cakes. Here is a very simple recipe which uses the same ingredients as my pumpkin pie spice and you probably already have the spices in your store cupboard. How long can you store them in the refrigerator? These sound delicious and I appreciate the reminder of how healthy buckwheat groats are. Yes they are kind of like that. I have them on my list to create a vegan version of at some point in the future too! These look so good! I love that they are no bake. Can’t wait to try! Thanks Jenn! The oven needs a break every now and again, as does the cook & these are so easy! Enjoy! ?